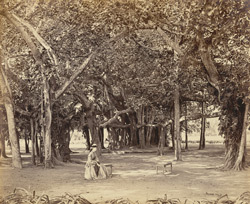 This photograph of a Banyan tree in Barrackpore Park was taken in the 1860s by Samuel Bourne. Barrackpore, north of Calcutta along the Hoogly river, was founded in 1775 as a cantonment and also as a summer residence for the British Governors-General. By the 1860s, commercial photography was becoming well-established in India and this growing market attracted the young Nottingham photographer Samuel Bourne to the subcontinent in 1863. During a residence of seven years, Bourne produced thousands of landscape and architectural views, but his fame and the success of his studio, rests primarily on the results of three arduous photographic expeditions to Kashmir and the Himalayas.